The demand for databases is on the rise as organizations build next-generation business applications. NoSQL offers enterprise architecture (EA) pros new choices to store, process, and access new data formats, deliver extreme web-scale, and lower data management costs. 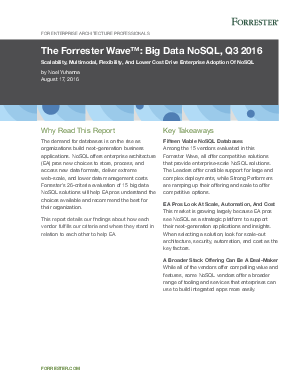 Forrester’s 26-criteria evaluation of 15 big data NoSQL solutions will help EA pros understand the choices available and recommend the best for their organization. This report details our findings about how each vendor fulfills our criteria and where they stand in relation to each other to help EA.